300 families In the Albuquerque South Valley are Having happier holidays this year After David Elias purchased 300 turkeys and all the fixings for three hundred families.David Elias Has met the Criteria To become the Second recipient Of our award The Duke City Times Hero Award For “extraordinary actions that benefit the community and improve our quality of life” And we are honored To List him in our records as an official Duke City Hero.Elias Will become The Second recipient of our Hero award and will never be removed from the record,the first was Magdalena Romero for Her selfless advocacy for victims of Crime In New Mexico.Mr. Elias Your are a true Hero and we thank you sir.We interviewed people about what you were doing and we want you to know that many people are so very happy and grateful for you and that you really made a huge difference in our lives and community,Not very many people come out like that on there own. 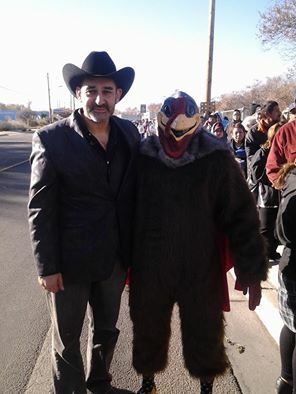 This type of event was quite different in concept,maybe that’s what makes it great,It was something that made a difference,something that let people know its not that bad,that there still heroes out there.We at the Duke City Times hope that many people follow the lead of David Elias,we hope that more people in the community get out there and make a difference,nonetheless,we will still hold strict guidelines for our award,we want to make it really one of the hardest awards to receive in new Mexico,one where a person cant be referred,we must witness it in action,and make the determination if the recipient is a TRUE hero,till then will keep our eyes open for the next DUKE CITY HERO..